Who is responsible for Modi to come to power? Mani Shankar Iyer, without any doubt, with ample support from ‘Diggy Raja’ Digvijay Singh and others like Kapil Sibal. Every time these illustrious supporters of dynasty rule in India spoke, they only put their own feet in their mouths so that Modi and the Bharatiya Janata Party got more supporters. No single factor played a bigger role in getting Modi elected than Mani Shankar Iyer’s ridiculing of Narendra Modi as a ‘Chaiwala’ (roadside tea seller) who could come to the Congress session to sell tea. Every statement of Diggy ( some say doggy) Raja linking RSS with everything wrong that happened in the country has actually won him more votes. They and and lawyers like Kapil Sibal, Abhishek Sanghvi and Manish Tiwari who made a big show of their command over English language just to indicate that Modi was more at home in Hindi and was not a fashionable English speaker, drove more people away from the dynasty they were supposed to be rooting for. Arguing in support of triple talaq (the Islamic practice which allowed men to say ‘talaq’ thrice, even on phone, email or WhatsApp, to divorce their wives) Sibal said last week that women were incapable of taking decisions. That was just when the Indira Gandhi dynasty headed by Sonia Gandhi was trying desperately to stave off extinction by replacing crown prince Rahul Gandhi by his sister Priyanka Vadra as if the Congress party had no other intelligent person who can lead it. Supported by fundamentalist and radical Islamists, the Congress shouts about ‘cow vigilantism’ and ‘communal polarisation’ while organising ‘beef festivals’ including one yesterday in Kerala where a cow was brutally slaughtered in public and its beef cooked and served to the participants, obviously to spite Hindus. Every such act strengthened the Hindu fringe groups born as a reaction to minority appeasement. The absence of non-dynasty leadership in the Congress was so acute that the party was ready to be ‘led’ even by a dog as long as it belonged to that family. Around that time a picture made rounds on WhatsApp. being forwarded to millions of cellphones. 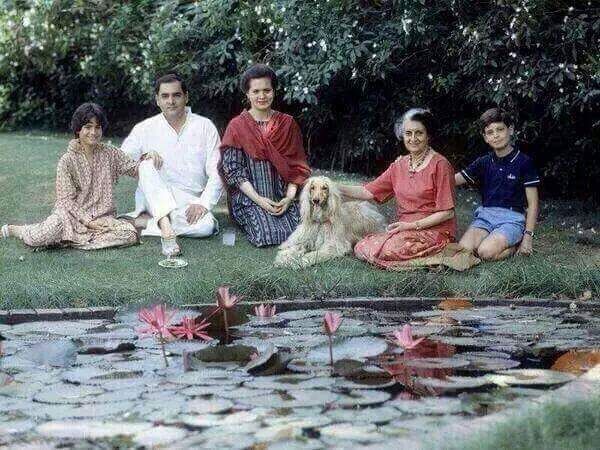 It showed the entire Indira Gandhi clan, obviously on a lake-side picnic when Rahul and Priyanka were still children, watching lotuses bloom in the lake. Incidentally, lotus has been the election symbol of Modi’s Bharatiya Janata Party. Previous Previous post: Technology – Enslaving or Our Slave? Next Next post: Do People Read….